Welcome to another edition of Disney In Pictures, the weekly series that invites you to share your photos with the readers of My Dreams of Disney! Each week I announce a theme, and open it up to you to pick your favorite pictures to share with us! I have a lot of fun with this series, it’s my small way of saying thank you to each and every one of you for contributing to the success of the site! 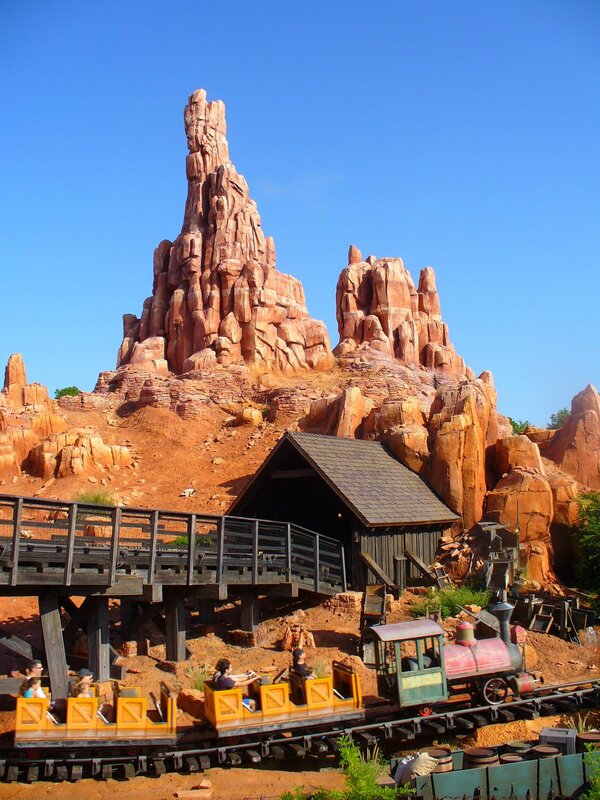 This week, the theme is “Frontierland” so let’s get started! 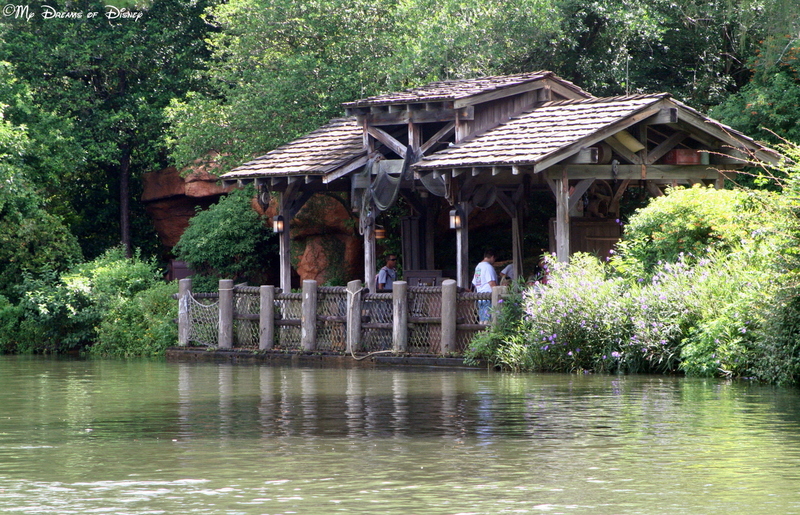 Who doesn’t love Frontierland? My first photo is actually two photos. It’s two views of the same cabin: one burning and one not. I wish it still burned! 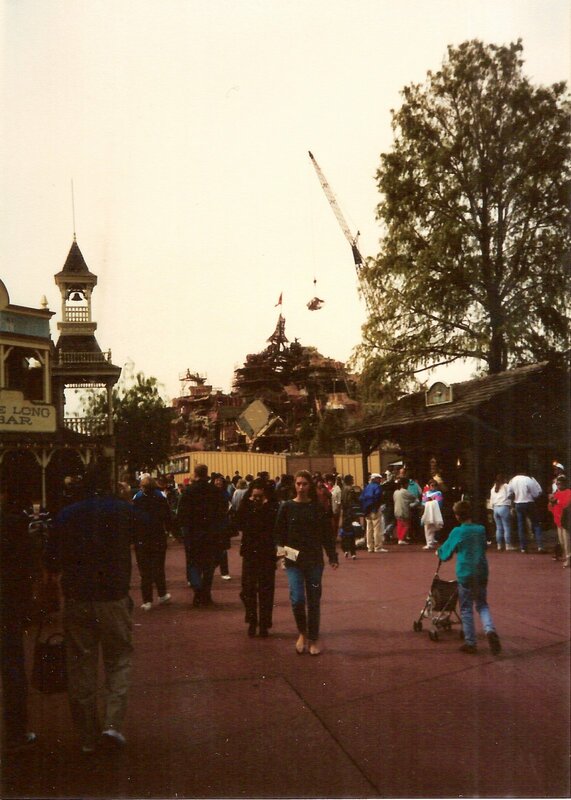 The second is one I took YEARS ago of Splash Mountain under construction. I love being able to look back on something wonder being built. 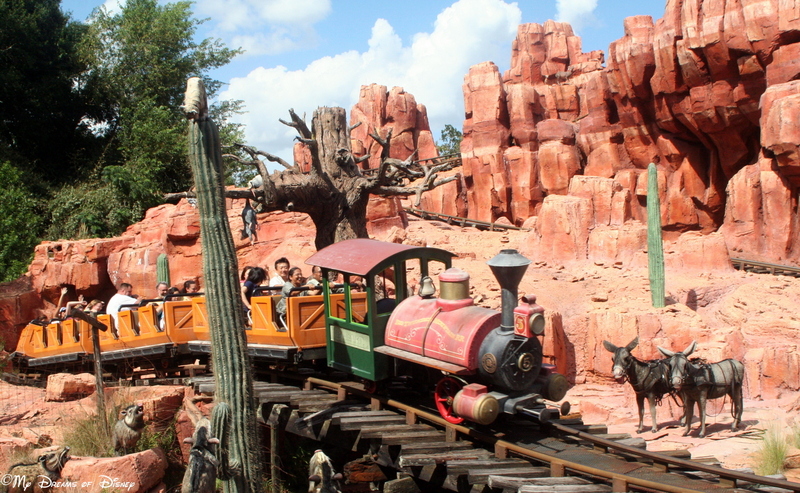 The third photo is just outside the exit to Big Thunder Mountain. 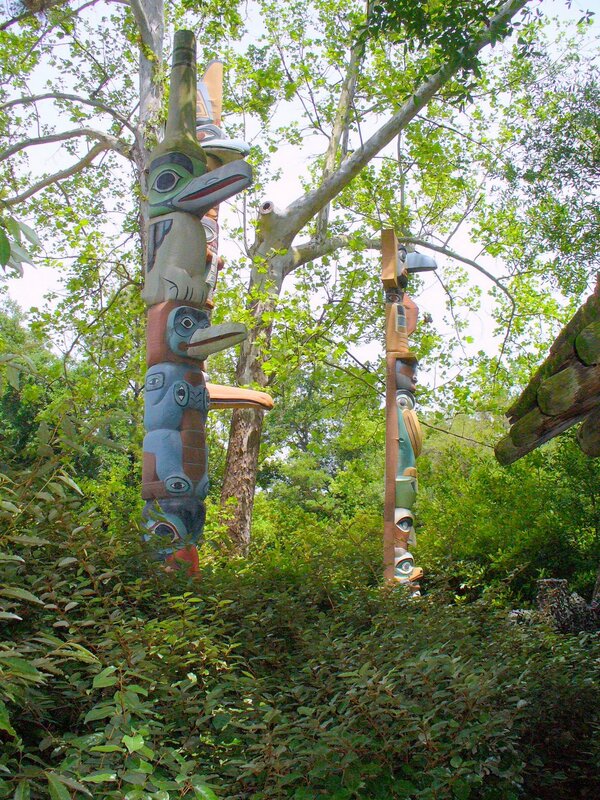 I must have walked past these Totem Poles for years before I noticed them. They sure are majestic! 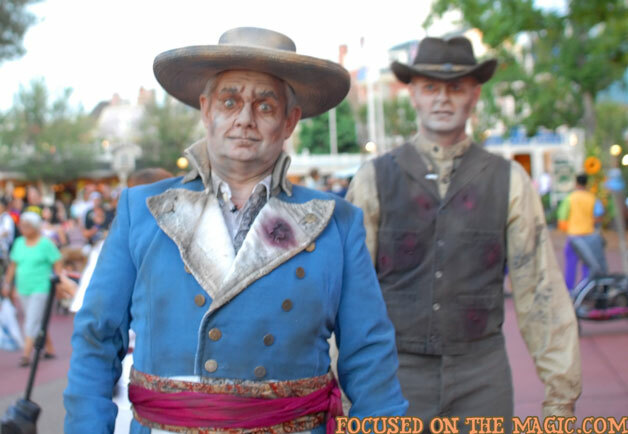 Frontierland is a great place to see characters, too! 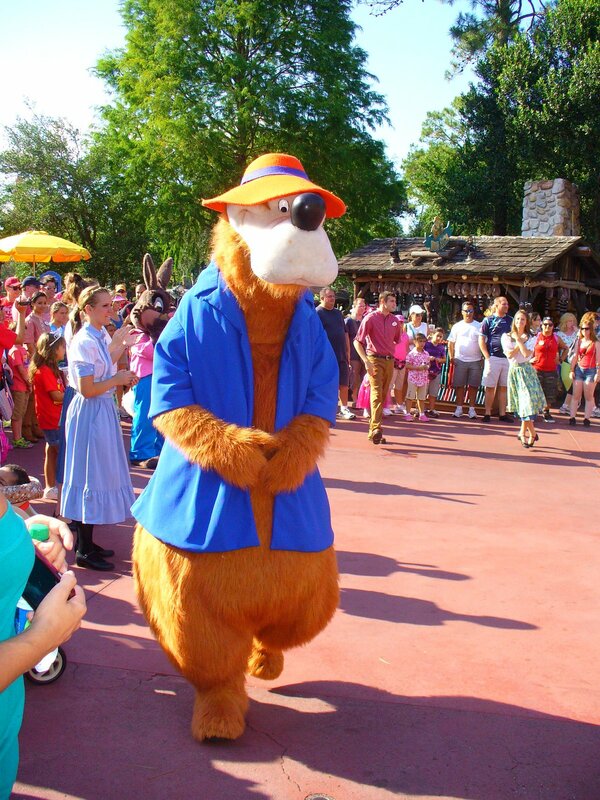 Here’s Brer Bear! It’s great to see so many from SONG OF THE SOUTH. I think it odd that they’d have a major ride and so many characters from a movie they say they won’t re-release. 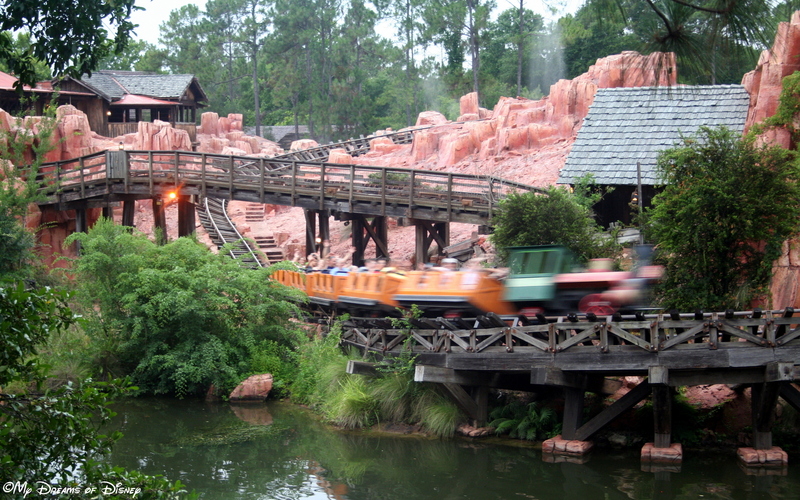 Lastly, Big Thunder Mountain itself. It’s my favorite ride at the Magic Kingdom. Even a slowly as I walk, if I’m there at rope drop, I can usually make it back there and be in one of the first trains out on the track! If you’re there early, keep an eye peeled and you just may see me heading back there at a fast waddle! Grins! My name is Nikki, and I live in Portland OR! 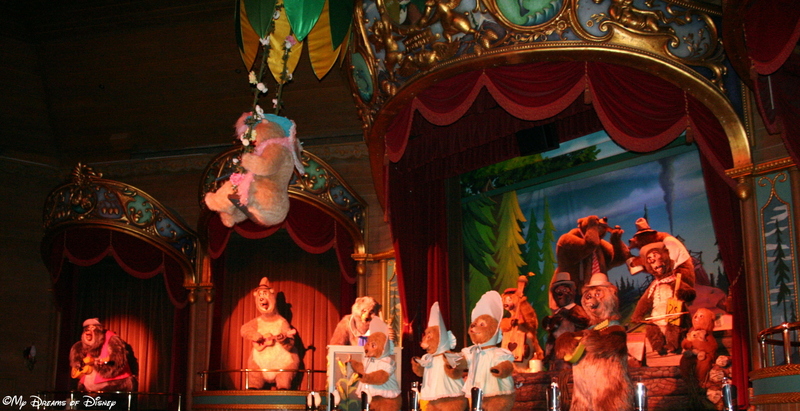 I’m sending you 2 of my favorite Frontierland photos (I hope Disneyland, is okay too)! The first one is of my 3 kids. 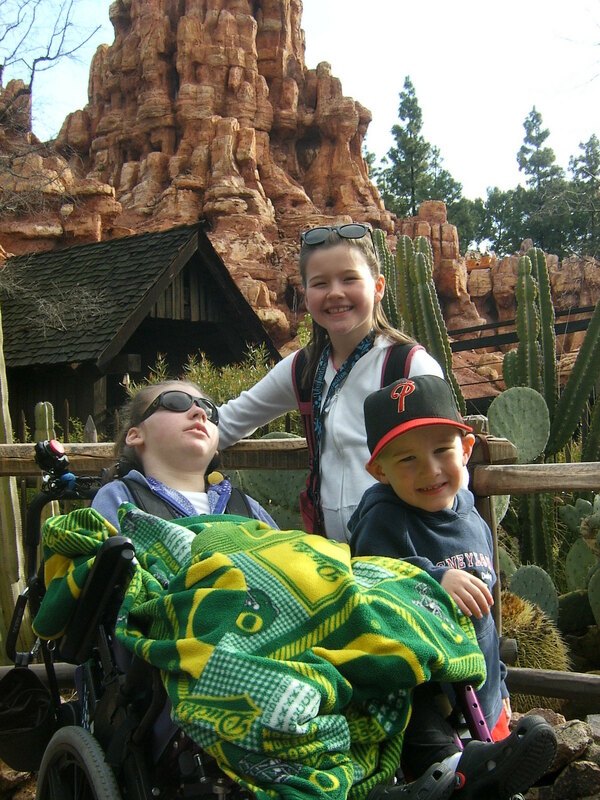 This trip to Disneyland was in March 2012, and they’re super adorable, so I had to send it. The second picture is my favorite WDW photo, of all our trips! It was taken in February 2011. 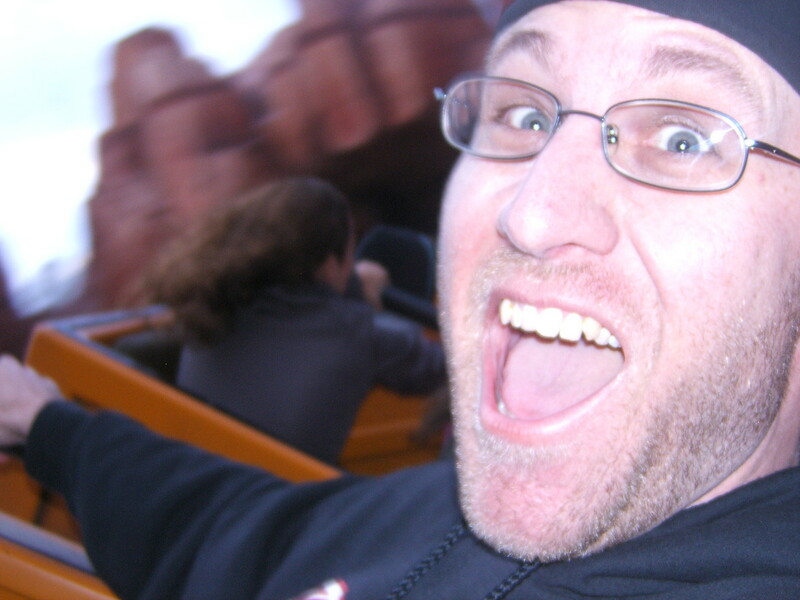 Jeremy, my husband, favorite ride is Big Thunder Railroad so this picture of him on BTR sums up so well that “kid at heart” feeling we all experience at WDW! BTW, we’re in WDW right now! AK tomorrow, yay! 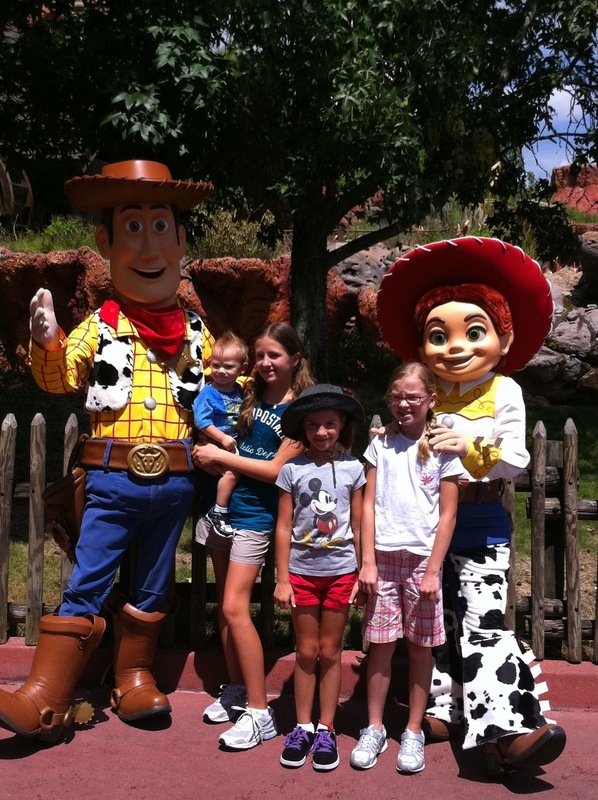 Here is my picture from Frontierland. 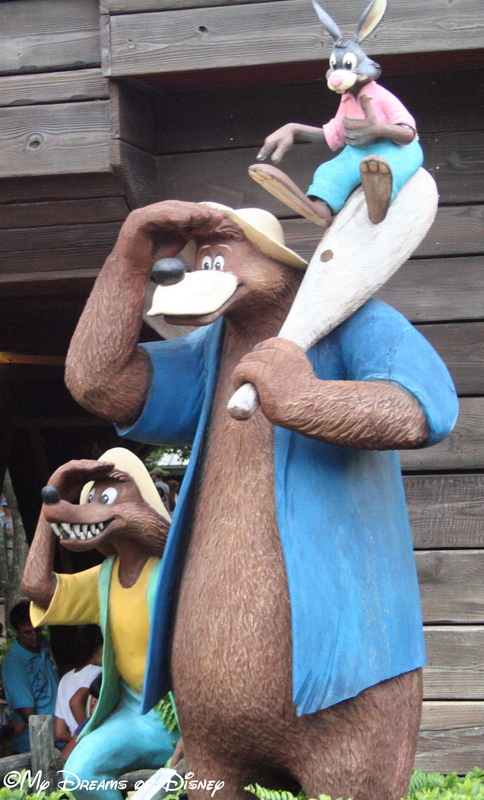 It is from our 2010 10 day trip when Jesse and Woody were appearing near Splash Mountain. My daughter was 8 at the time and loved Jesse! She had been asking to meet her the whole trip. Finally, on our last day there, we reluctantly decided to wait for close to an hour in the hot August sun so that she could leave WDW fulfilled. The smile on her face after getting Jesse’s autograph made waiting in that long line totally worth it. 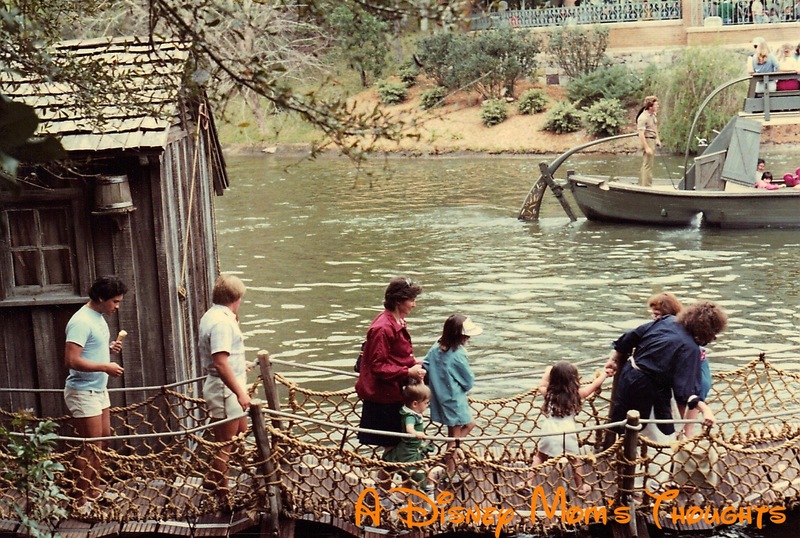 My friend Beth from A Disney Mom’s Thoughts had a picture from Frontierland to share with us! Here is what she had to say regarding her favorite memory of Frontierland, listen as she takes us back to 1983! front of us on the barrel bridge almost fell in the water! She was trying so hard to pull her daughter along that the bridge got out of balance. We still laugh about this and I’m so glad my dad stayed behind to capture this photo! 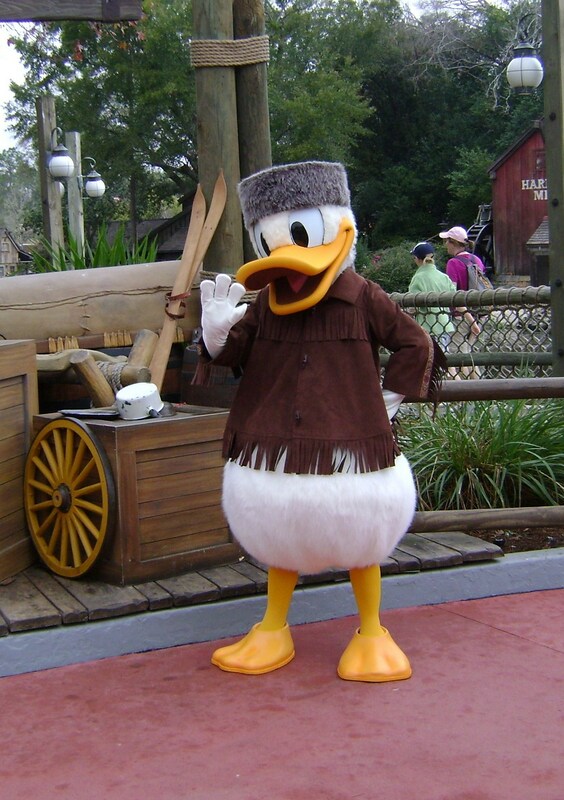 I was strolling through Frontierland and there he was the original, the one and only Donald Duck!!!!!!! That wraps up this week’s exploration of Frontierland! As always, though, I thought I would share some of my favorite photos from that land with you. Thank you to all of the people that sent in photos for us this week, and for next week, I’ve already got the theme in mind! Next week’s theme is going to be your “Favorite Disney Collectible!” Start thinking about your favorite Disney collectible you have at home, whether it be of a souvenir, or something you found online, or something entirely different, and take a photo of it and send it on to us! Remember, our email address is mickey@mydreamsofdisney.com, and include your name, why this picture is special to you, and your blog if you have one! Thanks, and start sending those photos in! Have a great week, everyone! Thanks for stopping by, and we’ll talk to you later! Remember, today is the last day for entering our $100 Disney Gift Card contest, so if you haven’t entered yet, click on the link to head to the post! Thanks, and good luck! 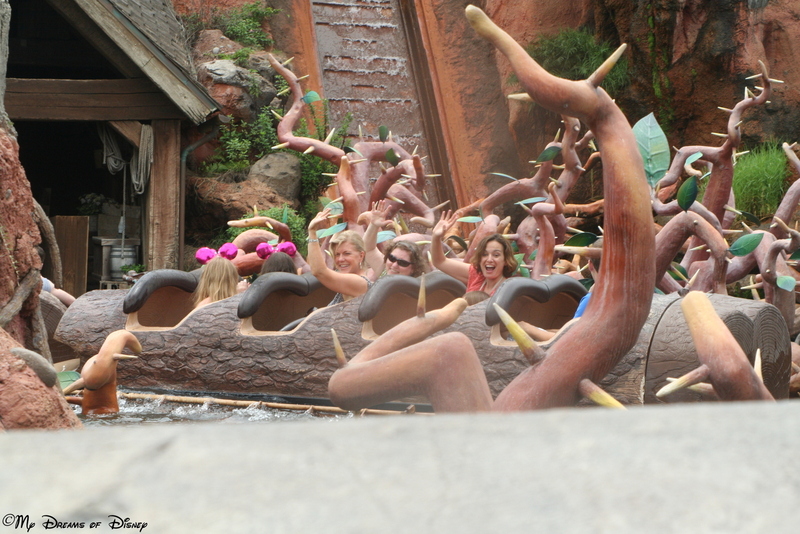 Disney Confidential – Enhanced Queue is in the Works for Another Attraction in Magic Kingdom! Previous Post: Planning our trip to Disneyland! Next Post: Congratulations Michelle W.!